I watched Bryan Smith's 23rd-ranked prospect make his California League debut two weeks ago yesterday and had a chance to interview him after the game. Nicholas J. Adenhart (A-den-hart) is a 6-foot-3, 185-pound right-hander out of Williamsport, Maryland. He is a very accomplished pitcher for someone who has yet to celebrate his 20th birthday. Adenhart was Baseball America's Youth Player of the Year in 2003 and its top-ranked high school prospect prior to his senior season in 2004. He tossed a perfect game in his first outing that spring, striking out 15 of the 21 batters faced. A cinch first-round draft pick heading into his senior year, Adenhart blew out his elbow in May and had Tommy John surgery one week after the Los Angeles Angels selected him in the 14th round (413rd overall). Area scout Dan Radcliff and director of scouting Eddie Bane convinced Adenhart to forego a scholarship offer from the University of North Carolina and signed him to a $710,000 bonus on July 26, 2004. Adenhart spent the next year rehabbing his elbow in Tempe, Arizona before making his professional debut on June 25, 2005. He pitched 50 innings in the Arizona and Pioneer Rookie Leagues that summer, fashioning a 3-3 record with a 3.24 ERA. Not surprisingly, his command was a bit off, walking 24 batters or 4.32 per 9 IP. However, he offset his wildness with 59 strikeouts, good for 10.62 K/9. At the age of 19, Adenhart earned a non-roster invitation to the Angels' big league camp this spring. He threw three innings without allowing a run. Nick faced the Chicago White Sox, the defending World Series champions, in one outing. "I threw strikes and got a couple of punchouts," he told me matter of factly in the locker room in the aftermath of winning his Cal League debut for the Rancho Cucamonga Quakes. 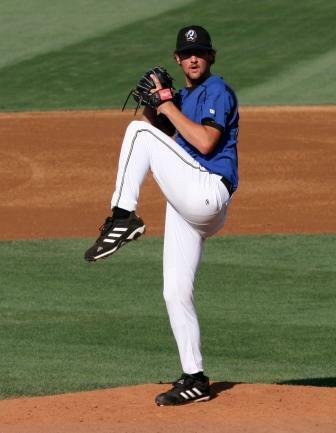 Adenhart was assigned to the Cedar Rapids Kernels (Low-A) out of spring training. He dominated Midwest League hitters, leading the circuit in wins (10) and placing third in ERA (1.95) and strikeouts (99 in 106 IP). His performance earned him a starting assignment in the All-Star Game on June 20 and a promotion to the organization's High-A affiliate nine days later. Sporting a Fu Manchu-style mustache, the dark-haired prized prospect got the start on July 2 and pitched six innings, allowing four runs on eight hits and three walks while striking out four in front of Bane and several scouts. Thanks to Ben Johnson's 3-for-3 night (including a pair of home runs and two walks), Adenhart earned his first victory for the Quakes and his 11th of the season in a performance that was less than overwhelming but hinted at his star potential. Six of the eight hits were to the opposite field and the only extra-base hit was a slicing double to left in the fifth that failed to produce a run. "My pitch selection was good, but I left a couple of the pitches over the plate with two strikes," was Nick's response when I asked him about his outing. "I wasn't at my best in terms of command." Trying to establish his fastball the first time through the lineup, Adenhart ran into trouble in the second, allowing four hits (including three in a row to open the inning) and a trio of runs. "My touch and feel was off, and I was trying to do too much." Adenhart "calmed down" and gave up just three hits and one run over his final four frames. "I located my fastball better down and in the zone." The second-year pro throws a two-seam and a four-seam fastball. "I throw my two-seamer about 80-90% of the time. There is no difference in velocity between the two fastballs. I use my four-seamer when trying to elevate on 0-2 and 1-2 counts or into left-handed batters and away from right-handed batters." Adenhart's fastball was clocked in the high-80s-to-low-90s, topping out at 94 on a few occasions. He is an extreme groundball pitcher and has only given up two home runs in 170 innings in his professional career. "Both home runs were on changeups that I left up." "I get good sink on my two-seamer," while attributing his favorable groundball-to-flyball ratio to the pronation in his delivery. Nick recorded 11 of his 14 non-strikeouts on the ground the evening I saw him pitch. Adenhart, who was invited to but did not pitch in the Futures Game, also throws an 11-to-5 curveball in the mid-70s and a circle change in the low-80s. "My changeup tends to be a strikeout pitch. I get lots of swings and misses, especially down-and-away to left-handed batters." I asked Nick how his elbow felt two years after undergoing surgery performed by Dr. James Andrews. "My elbow is great. It feels different than before I had the surgery. But there is no pain or discomfort." Although Adenhart won't turn 20 until August 24, I wouldn't be surprised if he made it to the big leagues at some point during the 2008 season. Once he arrives, the kid with the three "plus" pitches is apt to become part of a starting rotation that could include Kelvim Escobar, John Lackey, Ervin Santana, and fellow 2004 draftee Jered Weaver. The future of the Halos looks bright indeed. Photo credit: Rob McMillin, 6-4-2. The Angels made getting him so easy. The Cubs tried the same thing this year with a TJ guy, only for more than a half a million more and with a name no one has ever heard of. I am surprised that year that Dexter Fowler and Adenhart were had so relatively cheaply (under $1 million). Well, that's why some teams have a future and some teams don't. Adenhart throws an 11 to 5 curveball? I don't know how a right-handed pitcher can do that. Then Adenhart says he throws his four-seamer "into left-handed batters and away from right-handed batters." I find this almost impossible to do. This guy has got to be the greatest magician ever with a baseball in his hand. It's 11-5 if you're the hitter. "Then Adenhart says he throws his four-seamer "into left-handed batters and away from right-handed batters." I find this almost impossible to do. This guy has got to be the greatest magician ever with a baseball in his hand." Seems pretty obvious that he gets action on the four-seamer so that it cuts in on a lefties' hands and runs away from the righties' bat. That would be consistent movement on the ball and would seem that his four seamer is more of a cut fastball. Thank you, Seitz and MPK. 11 to 5 is the rotation on the ball as you view it from behind home plate...the 4-seamer is mostly backspin--straight...you throw it inside to LHHs to avoid running the 2-seamer back over the plate...throw it away to RHHs for the same reason.. I played with and against Nick growing up...Tremendous competitor, great guy.